A Bullseye is more than a psychopathic assassin from the Daredevil comics known for his lethal precision and accuracy with any weapon including guns, knives, throwing stars, and even pencils. 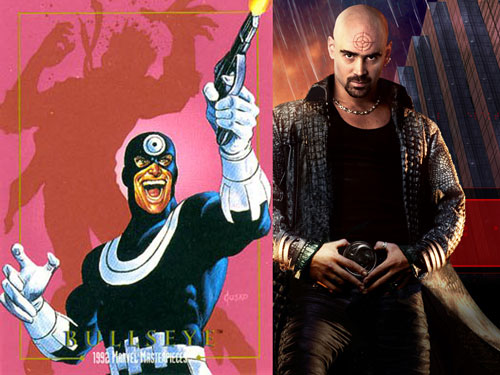 If you are not familiar with the comic series, then you maybe remember the character as portrayed by actor Colin Farrell in the Daredevil live action film starring Ben Afleck. This image is not property of Team Surra Outdoors. We claim no rights to the image or its content. Of course, bullseyes mean something much different to avid hunters who seek the quickest and most effective kill of their targeted species to avoid wounding animals in the effort to put meat in the freezer. Properly sighting in your weapon of choice is the first step towards possessing Bullseye’s famed lethal accuracy and filling your tag this coming season. Sighting in your hunting rifle and shooting it regularly should help you build confidence with your weapon and ensure effectiveness and consistency prior to using it in the field. Confidence and effectiveness is key when the time comes to shoot during your hunt. In the heat of the moment when your mind is preoccupied with shot selection your body needs to be on autopilot and you need to be able to replicate shooting-range-like accuracy. Obviously, this all begins with a properly honed weapon. When we go to the rifle range all of us want to at least hit a large paper target. Be sure to have your rifle and scope bore sighted before heading to the range. This should allow for your bullets to hit the paper at 25 yards. Start at the 25 yard position. Put up a large paper target. Get as comfortable as possible on the shooting bench. Bring plenty of pillows and folded blankets to help you place both your body and your rifle at the most comfortable shooting position on the shooting bench. I am not a big supporter of sandbags or mounts when sighting in my hunting rifle because I feel it is important to hold the rifle in your hands and replicate your body position with each shot. Afterall, practice makes perfect. Once you are in a steady and comfortable position at the shooting bench with the rifle pointed at the 25 yard target set your variable power scope to the highest practical power that delivers a clear view of the bullseye while still allowing for a distinctly bold reticle. This may vary from person to person and may not be the maximum magnification for the scope. For example, the view through a 3-9x scope may look better at 7x or 8x than it does at 9x. Take three shots to get your grouping. You will want to start sighting it in to the center of this group. Examine the target, find your bullet holes, and adjust your scope the number of clicks or increments required to move the point of impact to the center of the target. For example, let’s say the instructions that came with your scope tell you that each click moves the point of impact 1/4 MOA (minute of angle), which is 1/4 inch at 100 yards. Remember you are at 25 yards, not 100 yards so you have to multiply the number of clicks by 4 to compensate the adjustment to match the shorter distance. Turn the adjustment in the required direction and tap the dials. This helps settle the adjustments of many scopes. Shoot another group of three to confirm that your adjustments were in the proper direction. You may have to adjust the scope multiple times to get your groups into the bullseye. By the third or fourth shot and adjustment period your bullets should impact your target inside of the bullseye. If it isn’t, something may be wrong. Check the scope mount screws for tightness ensuring absolutely no movement of the scope under recoil. Let’s assume that your rifle is now hitting within an inch or less of the point of aim at 25 yards. Move your target back to 100 yards and fire another group of three. 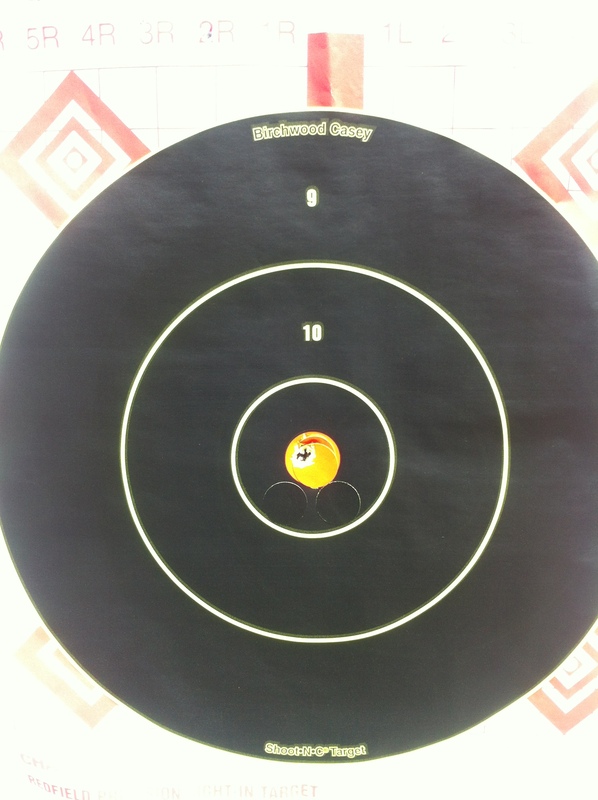 Your grouping should at least be on the paper at 100 yards. Repeat your adjustments and groupings at 100 yards until you are consistently hitting in and around the bullseye. When you are finished hopefully your shoulder is still in good shape and you haven’t wasted a lot of ammunition. More importantly, you can rest assured that your rifle will be ready to help you capitalize on your big moment this fall. As always if you have any question feel free to email us at teamsurra@gmail.com. Dont forget to “like” us on Facebook and follow us on twitter @SurraOutdoors.